Out-of-home player, JCDecaux, has signed up with Data Republic, becoming the first media owner to join the data exchange provider’s Open Data Marketplace. Established in 2014, Data Republic’s technology offers a marketplace for organisations wanting to enrich their own customer insights by sharing data. The company’s data pool has been bolstered by proprietary information sourced from some of Australia’s largest companies including Westpac and Qantas Loyalty, along with open government data sets. The new partnership allows JCDecaux to access geospatial, behavioural and transaction-level insights as well as list, trade and collaborate on data exchange projects, opening up new avenues to augment its offering. “Building on the positive launch of our geospatial planning tool, Orbit, we are looking forward to aiding even greater understanding around the impact of our inventory via the fusion of rich behavioural and transactional data,”said JCDecaux’s CEO, Steve O’Connor. Marketing director, Essie Wake, added access will allow JCDecaux to start closing the data loop on media attribution and tie in-store sales to campaigns running on the out-of-home player’s assets. Data Republic founder, Paul McCarney, said the startup’s technology is aimed at opening up insights and connections between media owners and brands to drive better accountability and data-driven campaign planning. “We’re looking forward to working closely with JCDecaux to facilitate secure access to data, driving more effective and personalised media strategies,” he said. Data Republic gained a significant boost to its expansion efforts when it secured $10.5 million in investment funding from three key Australian companies: NAB Ventures, Qantas Loyalty and Westpac’s ReInventure Fund. The partnership also comes as JCDecaux experiments with a range of technology capabilities within its out-of-home panels. 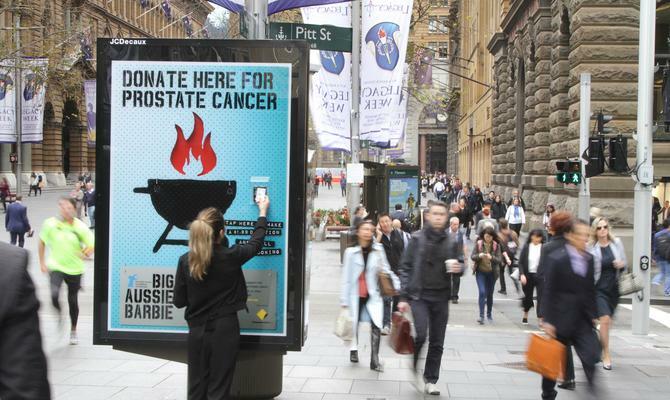 Last month, for example, the company launched the new ‘Scentsational’ campaign for the Prostate Cancer Foundation of Australia, which combines tap and go technology with scent and sound to give consumers a sensory reminder of the Big Aussie Barbie aimed at raising money for research, awareness and support (pictured). JCDecaux also recently helped rolled out what it claimed was the first digital colouring book outdoor campaign for Deep Spring, using custom-built panels with built-in digital touchscreens that allowed consumers to colour in Zentangle patterns featuring inspirational quotes.